Where does Digital Identity lead to? Recent debates about ‘digital identity’ often diverge into two groups. Complex technical discussions about ‘identity management’ which become laden with acronyms and battling tech factions. Complex esoteric discussions about the nature of identity, truth and the human condition in which favored philosophers, linguistic theorists or psychoanalysts are brought out from the bottom draw and those involved in the debate either tune-out or have some form of digital-existential crisis. Both of the above quickly become abstract and are almost impossible to combine in a pragmatic manner. In an attempt to move this debate forwards I simply want to change the focus from ‘What is digital identity?’ to ‘What is the point of having a digital identity?’ In essence: What is the function of my online persona? My answer is that a representation of identity is a necessary precursor to forming relationships (personal/professional/educational). To put it another way the majority of us want to exchange social capital, to built trust, to gain kudos and to communicate with others. It’s much more effective (or maybe satisfying is a better word) to do this via a persona or identity rather than a blank-faced identifier. 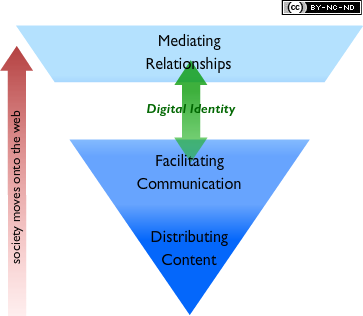 The diagram below places the notion of ‘digital relationship’ in context. We seem to be very poor a separating these three layers when discussing what the web can, and does, provide for us. In my opinion it is not valuable to explore the web represents as a ‘means of content distribution’ anymore. Content is no longer the webs weak point in the way it used to be 15 years ago, Wikipedia is proof of that (the trust issues being a smoke screen thrown-up by traditionalists). Producing content and uploading is of course integral to the web but it needs to be seen in its proper context and not presented as ‘new’. For example, podcasts are simply a way of moving content around. They do have an impact as a new mode of distribution but at heart they are exactly the same as sending audio cassettes through the post. We need to be careful not to misrepresent efficiency/feasibility as fundamental change. At another level we have become comfortable with using the web for basic communications. If we are honest this is mainly email which most people are comfortable with because it’s simply a version of an offline format. Where it starts to get interesting though is when individuals move beyond the simple identifier of an email address and start to project a persona onto the web that could be called a social presence. The web offers a myriad of ways to do this. Some of them such as photos are not new but others like, microblogging, social networking and 3D avatars are. These new modes of representation do throw up complex identity issues but what is really important is that they allow us to form relationships and build trust in a manner which is more immediate and dynamic than the pen pal style interaction of email. The potential of these new modes of interaction to increase the ‘emotional bandwidth’ available to build relationships is both exciting and daunting. In an educational context it is important to consider how the manner in which identity can be ‘projected’ by certain online services might affect the facilitation of the traditional student, tutor relationship1.. This moves us away from the web as a means of content distribution and focuses back on the heart of teaching and learning. The most valuable ‘reusable learning object’ is the tutor. They contain expertise which can be automatically tailored to a given teaching situation. They are one of the key reasons individuals choose to attend university instead of staying at home and reading books (other than gaining a qualification and socialising). The emergence of ‘digital identities’ marks a new maturity in the web which has becomes a platform capable of sustaining educational relationships. The new forms of social engagement available online influence educational relationships in a variety of ways; for example, microblogging and MUVEs tend to erode the traditional stratification of expertise and authority between students and tutors whereas online meeting rooms and VLEs tend to support existing hierarchies by replicating real life roles such as ‘Presenter’ and ‘Participant’. It is also possible to see subtle shifts in dialect and acceptable behavior when moving between online services, an understanding of which should be included in the notion of what it is to be ‘digitally literate’. So, let’s avoid getting caught-up in the recent epistemological cul-de-sac that is the digital identity of the individual by considering not what digital identity is but where it leads. Let’s explore how it can move us to the place where the potential for the most intense learning resides; in the relationship between the tutor and the student. Attending the Staff and Educational Development Association (SEDA) conference in Brighton last week was an intriguing experience for me. There was something in the atmosphere that I had trouble tuning into, something which pervaded every session but which I couldn’t pin down. Until, at the end of the first day I had sudden moment of clarity, the mysterious and all pervading dimension to this conference that was evading me was the fact that these people really care about what they do. The importance of not allowing educational research and teaching practice to continue to diverge was a key theme which suffused the conference. This trend is to the detriment of both groups who need to learn from each other. It seemed clear to me that institutions should to do more to create roles which are less segregated, roles sit under the larger banner of ‘academic practice’ that can denote research and teaching. The challenges inherent in making this happen was an area which I touched upon in my session entitled ‘Not Killing the Creative’. I reflected on the methods employed (some more successfully than others) in the recent JISC funded ‘Open Habitat’ project. Methods which attempted to make the overlap in the centre of the ‘educational researcher’ and ‘teaching practitioner’ Venn diagram as wide as possible. The majority of the SEDA delegates are in professional positions which act as a bridge between the highest tiers of policy making and the teaching/research (there’s that problem again) staff within universities. These are the people who have the ability to embed new teaching and learning strategies and to influence culture change within tertiary education. It was refreshing to hear the closing thoughts in the opening keynote including the phrases ‘We need to play the game” and “We have to be subversive”. If institutional approaches are to be improved from within then a subversive playing of the game by people who care is exactly what is needed.